Spring fishing is hot as ever in the Big Bend. 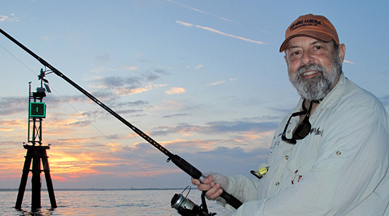 While the occasional front passed through, water temps have continued to rise toward the magic 60 degree mark. On warmer days when the sun shines on the grass flats, the trout are out and eating, and there have been some really nice gator trout taken this month. 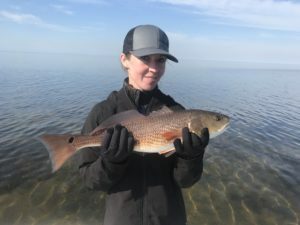 Redfishing is more consistent, but as is usual this time of year, most fish are schooling so moving around is important to increase your chances. 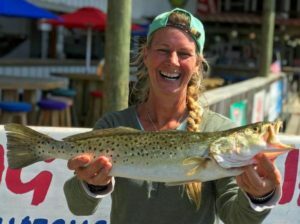 Jumping mullet and clear water are the keys, and while high wind and waves can make things tough for a day or two, things have been clearing rapidly. 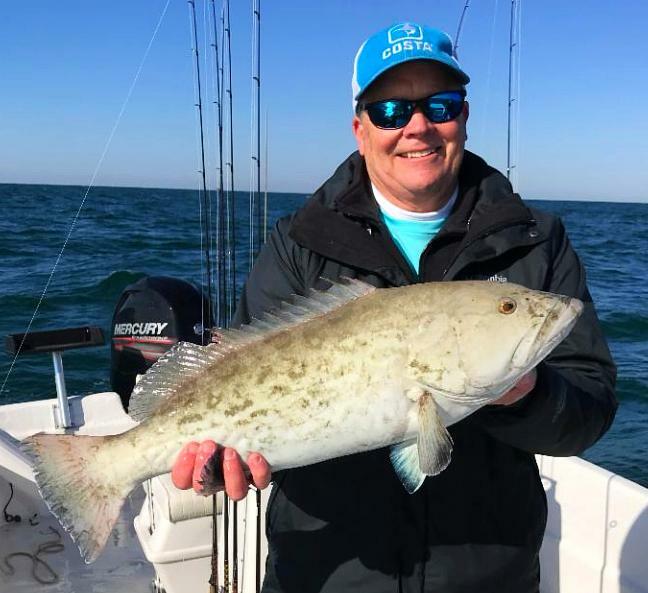 This month the fishing was continuing to get better throughout the month, with some of the hot spots the shorelines around Rock Point and Long Grass Point to the north, and the Pepperfish Keys and Sink Creek to the south. The Steinhatchee Community Tournament was a great success, and by the end of the month, the sheepshead fishing exploded. Some hints about fishing for these tasty fish in the forecast. 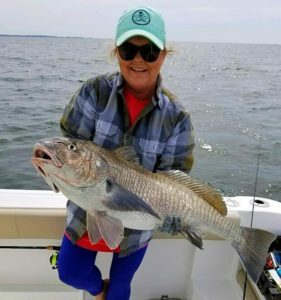 Here are some pics from this month. 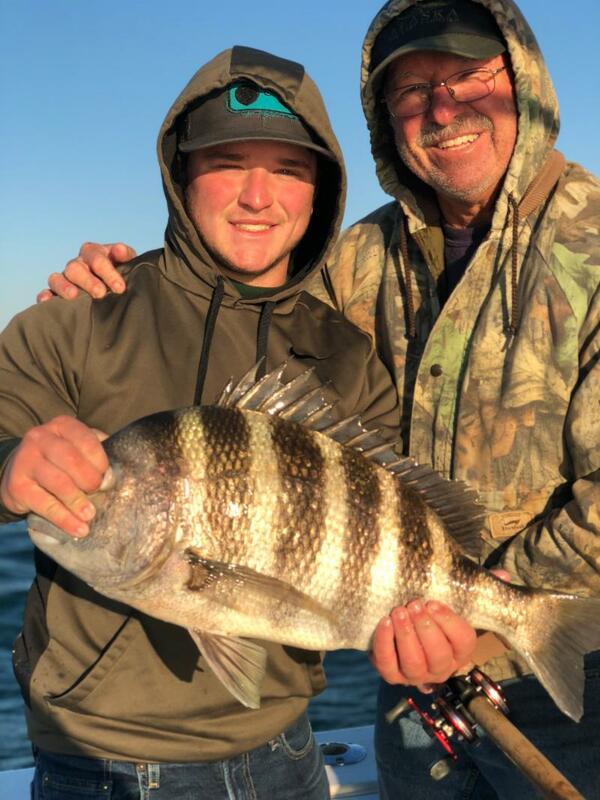 Bryce Woods went fishing with his granddad Donnie Kricklen and caught this 7 pound sheepshead. Chad Brooks from Tifton, Ga with a gator trout. Brenda Howard with a giant black drum. 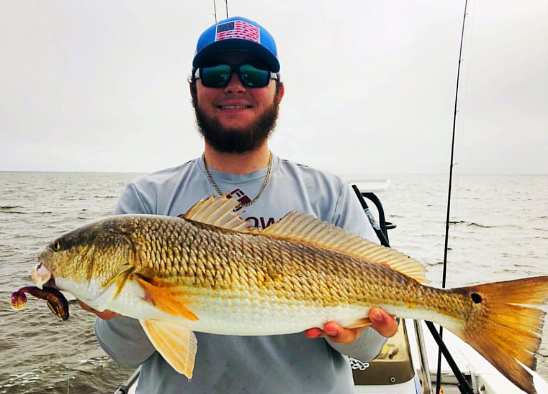 Lee Doucette came up from Miami to find this bull redfish. Dawn Potts from High Springs with a pair of great keeper trout. 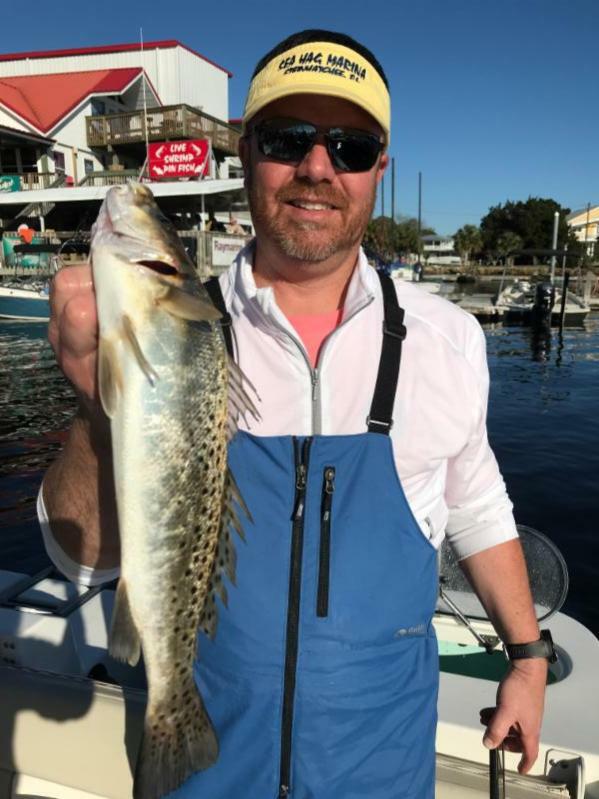 Mike Ferris from Jacksonville with gag grouper he released. 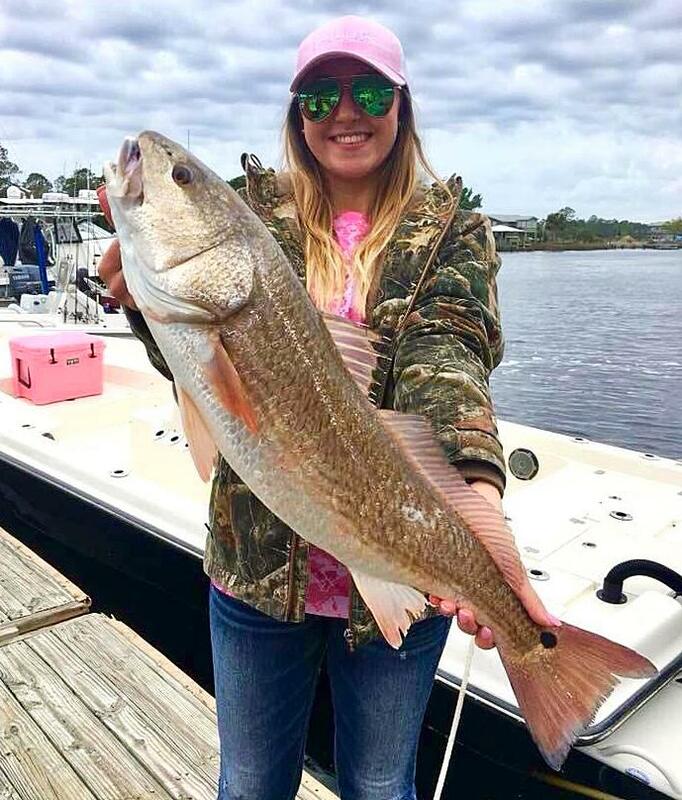 Maddy Fletcher weighed in this perfect 27 inch tournament redfish. Danny and Nick Allen won the Pro Redfish event by .1 of a pound and pocketed $10,000. Rodney Eller and Kim Sheffield from Eastman, Ga found a school of nice redfish. 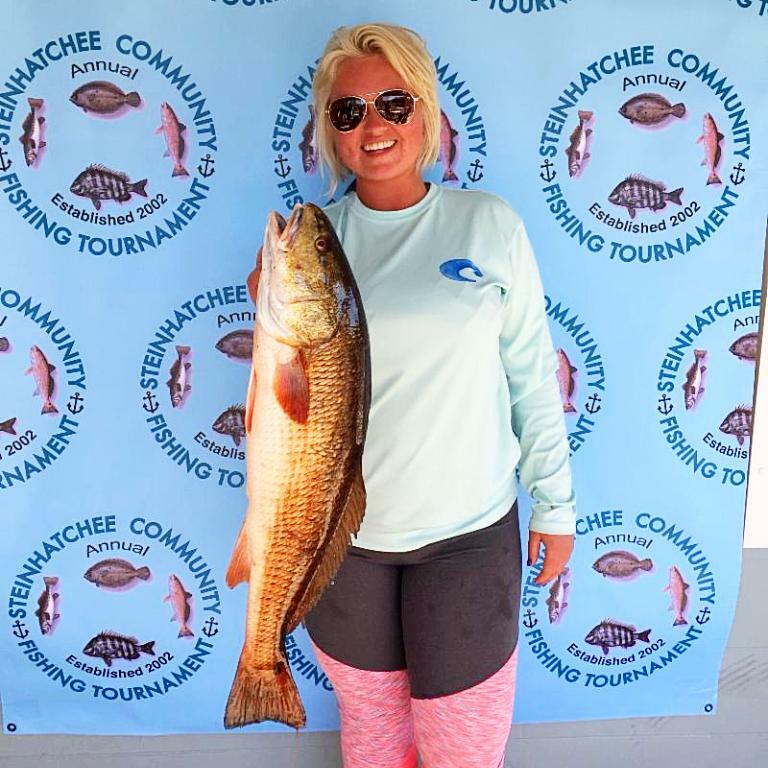 Vickie Wyrick caught the big redfish in the Steinhatchee Community tournament, a 7.95 pound bruiser. 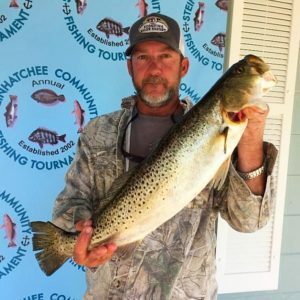 Bobbie Joe Woods won first place in the Community Tournament trout competition with this 5.8 pounder. 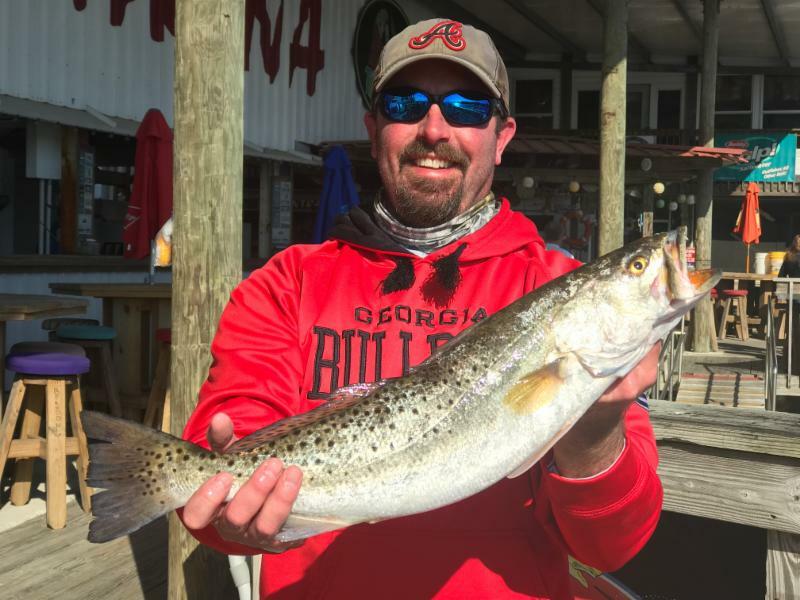 Jason Waddell came down from Dallas, Ga to find this upper-slot trout. Cooper and Connor Heimes enjoyed sheepshead fishing. Tricia Pulliam from Monroe, Ga with a monster trout. Redlee and Presley Baggs and Haden Rust from Jacksonville with part of their sheepshead catch. 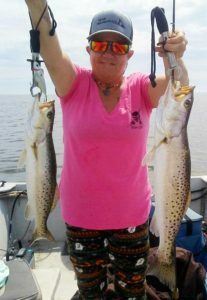 Lynn Charlton from Steinhatchee with her trout of the day. 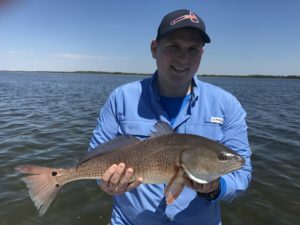 Elliot McDavid and his upperslot redfish. 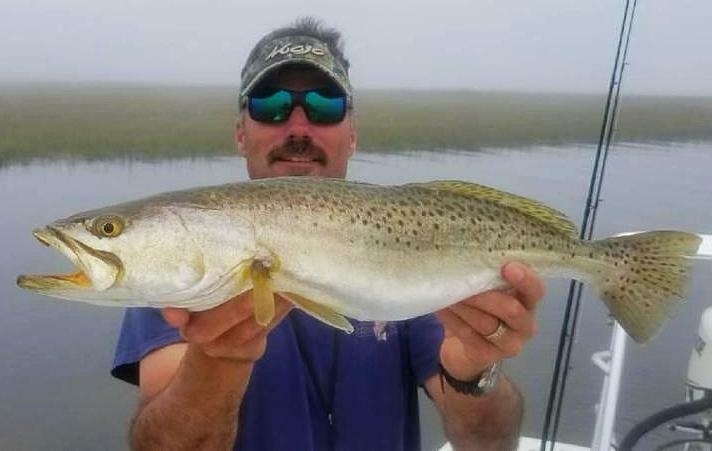 Toby Griffis fished the shoreline and found this massive seatrout. 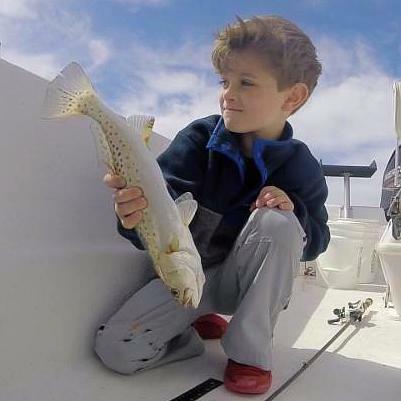 Jude Rhodes releasing a short trout. Nita Chester and crew had an awesome day on the water! 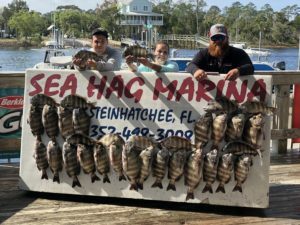 The severe storms in the past few years have disrupted the Steinhatchee Reef. 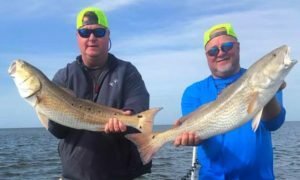 If you have old numbers, they can get you to the area, but use your bottom finder to find structure and fish. In general the rocks and concrete have moved somewhat to the north. Fish around as well as on top of the structure. 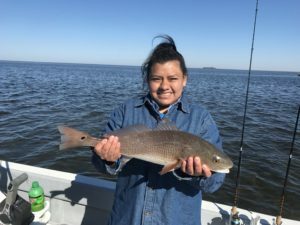 There are other rockpiles in the Steinhatchee area, but most are closely guarded secrets (and won’t be in this report to avoid risk to my life and limb). 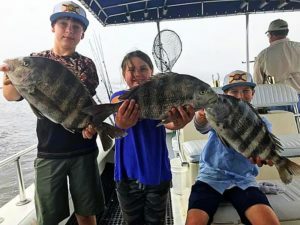 Most of the guides are doing sheepshead charters, and you may be able to wrangle a number of two out of some of the locals. 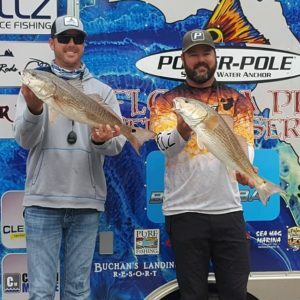 April is a big month for tournaments. 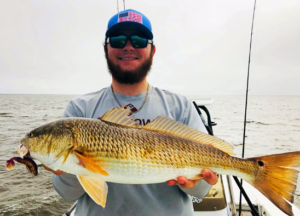 The 7th is the Hooked on Heroes to support our veterans; the 14th is the Kim Smith memorial tournament, Reeling for Rescues; the 21st is the first Fishing for Gold Tournament hosted by the Sea Hag Marina and the 28th is the Shands Fishing for Kids tournament. For any specifics about these tournaments, you can call the Sea Hag Marina. 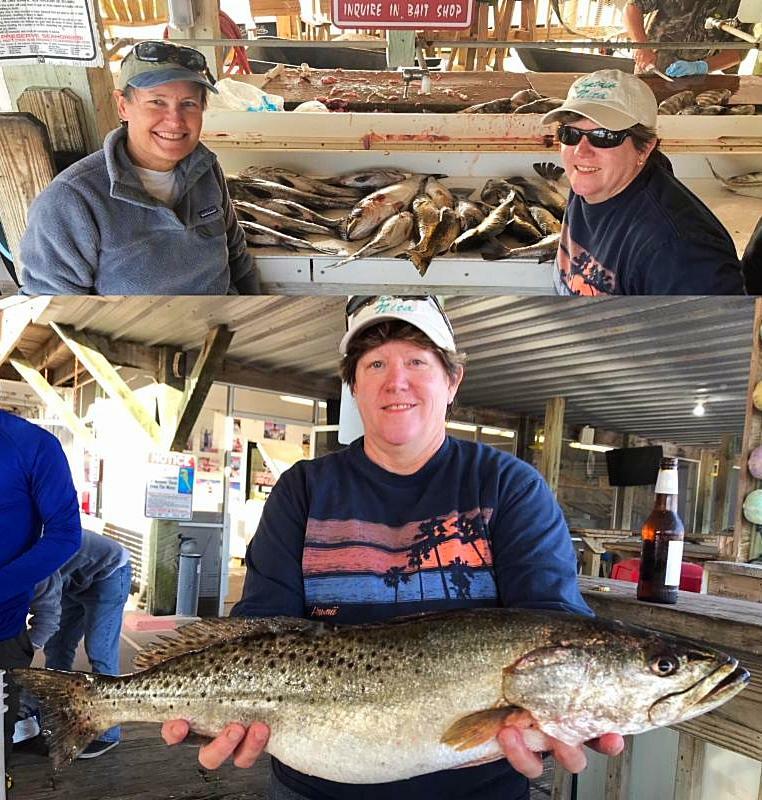 It’s going to be great month; call and get one of our newly renovated rental cottages, rent a boat or a guide, and let’s get off the couch and catch some fish!!! 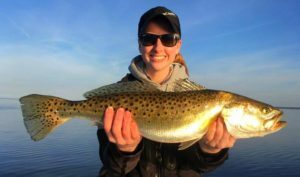 The flats have been active but the focus recently has been a little further out. 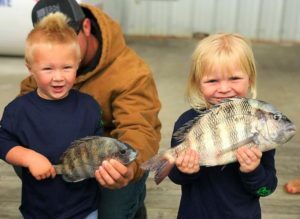 The sheepshead are in and are thick. 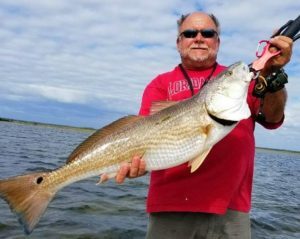 When the wind is calm enough we have been sneaking out there and catching them as fast as we can drop baits. Book a charter with me in the near future and if the weather is calm enough I’ll show you exactly where they are. 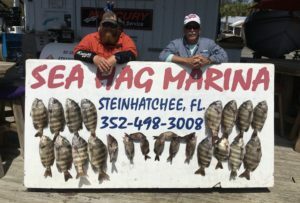 Come see us over here in Steinhatchee at the beautiful Sea Hag Marina–you won’t regret it!